Maybe you didn't know but Edmonton in Alberta is also known as a festival city. It offers residents and visitors many unique festivals and special events throughout the year. The city hosts a lot of sports events, entertaining music and film festivals, and celebrations of food and culture from around the world. Whyte Avenue is a historic street where a lot of events take place. 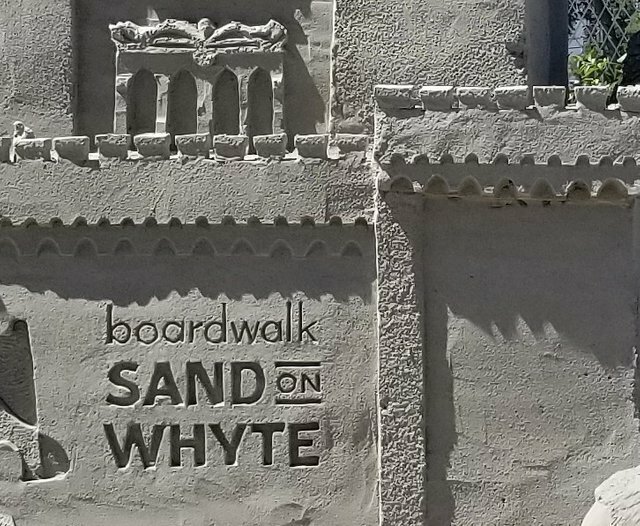 On the exact same spot where they built ice sculptures in the winter, the different artist built the sand sculptures this time. 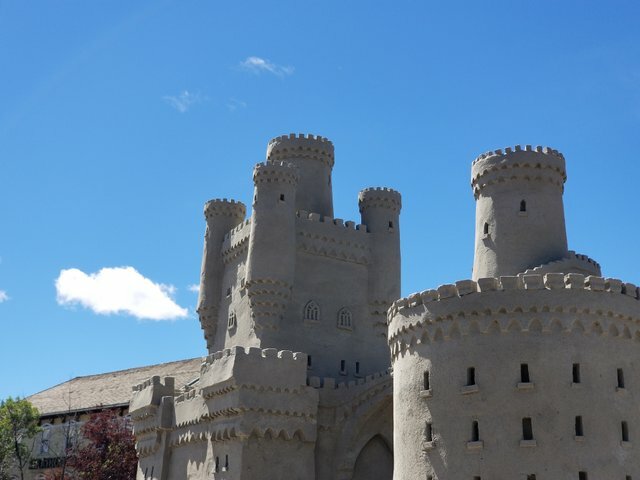 These castle towers with the blue sky is a good choice for the first photo. Alberta is a landlocked province which means we don't have the sea. Who says we can't have wave surfers? But we have a lot of lakes and this scene is quite often on lake shores. Even an artist got inspiration in it. Here are some statystics in case you're interested. Sandy animals were a real magnet for kids. The name of event carved in the castle's wall. 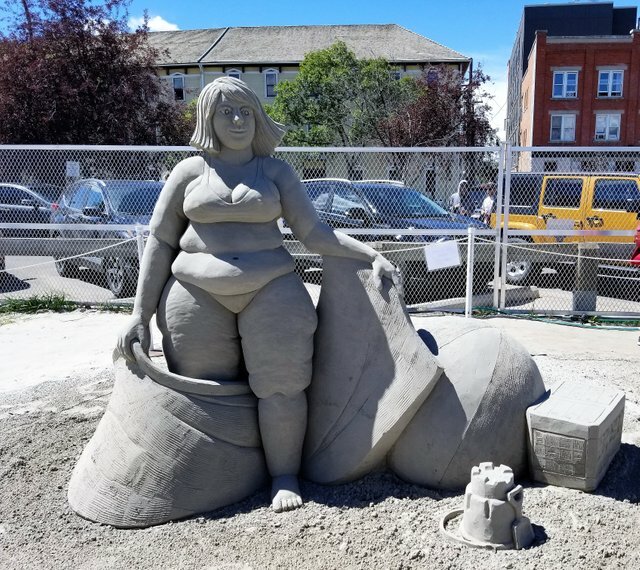 I guess the sand couldn't suport the shapes of Pamela Anderson and artist decided for this lady instead. And here is the whole castle. That's all for today. I hope you find my post interesting. Heads up my friends, Crypto space is in green again. Fingers crossed. Wow! 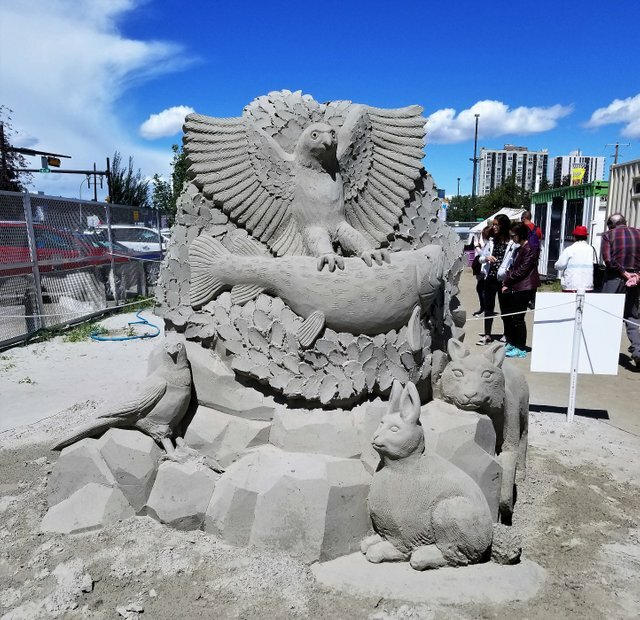 You did a great job capturing the work of some amazing sand artists. I am chuckling because I think of sand and warm weather. Everyone is walking around in coats. Thanks for sharing a bit of your adventure today. Until the next time our paths cross. all this pictures are very beautyful .. very nice click friend..
Wow. 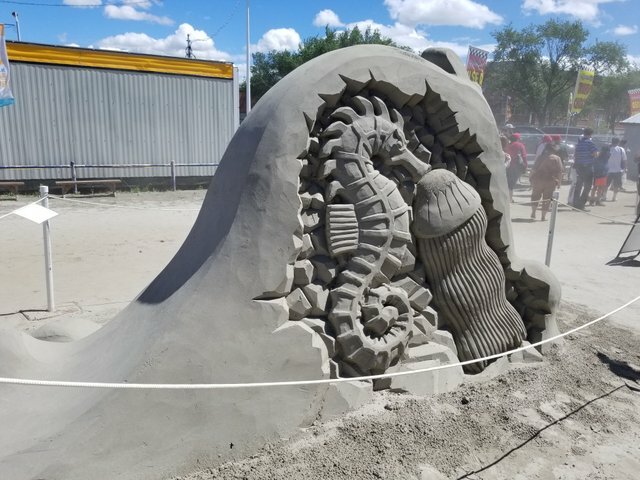 Those sand castles are off the hook! howdy there @oldtimer! I'd love to see these thing being crafted by the artists, I wonder how long it takes? 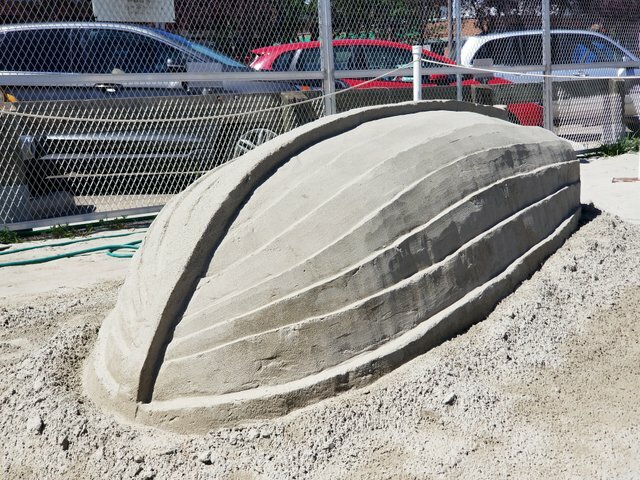 Sand building artists really took their art to the next levels in these last couple years. Every now and then, we have some of these here in our city as well. 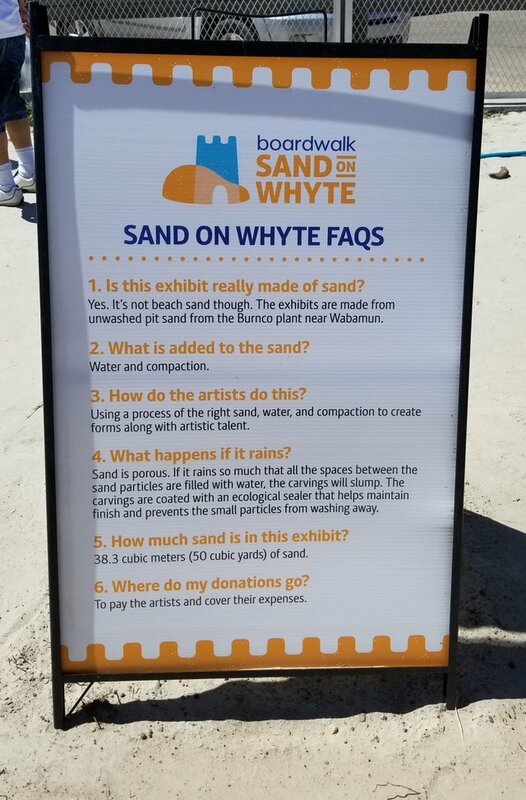 They take the sand with them, so they usually make smaller things like dogs. Highly impressive anyway, though. How it possible to make so large castle by sand. There are no limit of human talent ! 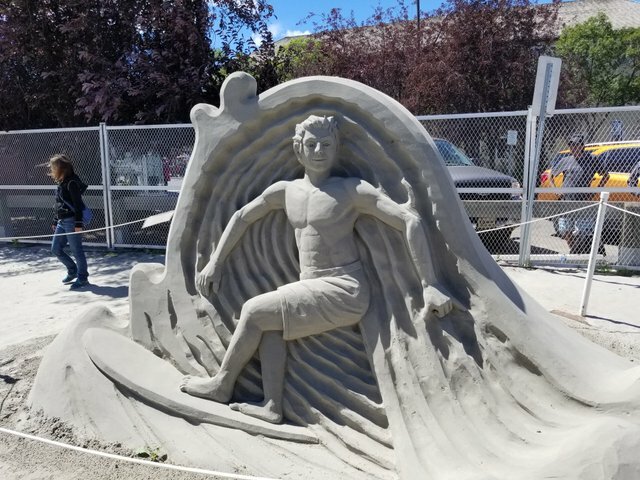 wow sand statues looking so awesome. Another beautiful photography. Appreciated my friend @oldtimer. Geniaaaaaal!! que locura. trabajo minucioso el de estos artistas. 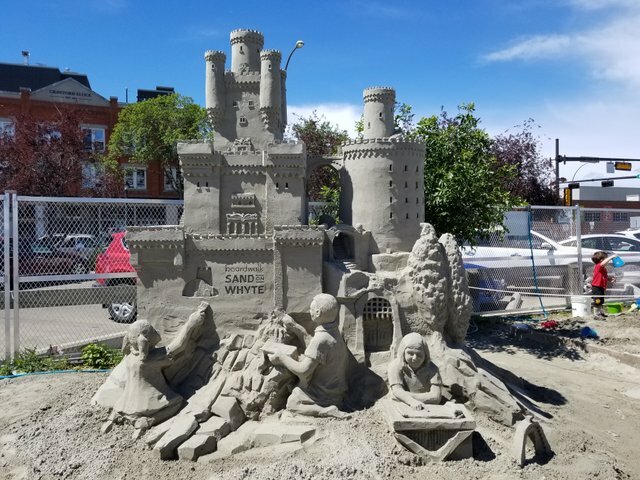 Wow... from ice castles to sandcastles this is a city for all seasons. The seahorse and jelly fish look like good friends!